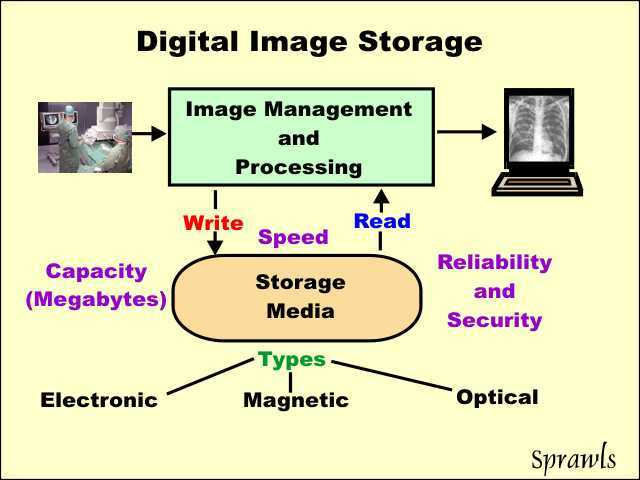 All digital imaging systems have one or more components (media) in or on which the digital images are stored. Here we are representing these collectively just as the "Storage Media". Later we will explore the various technologies that make up the storage media. Writing and reading refer to the process of transferring image data to and from the storage media. The numerical size (number of bits and bytes) of an image is a major factor with respect to image storage. 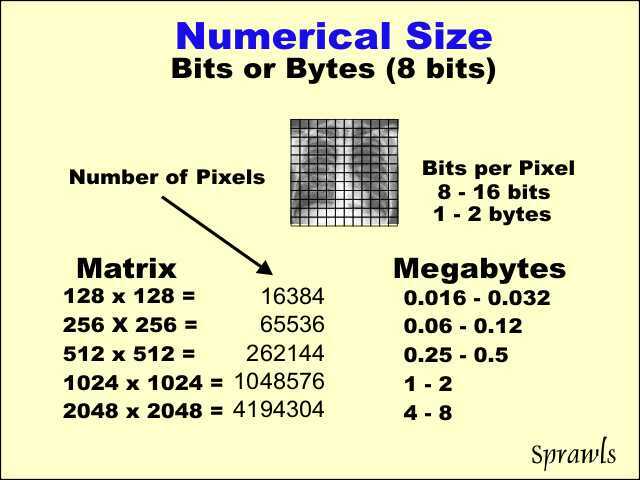 As we recall, the numerical size is the product of the number of pixels (which is determined by the matrix size) and the number of bits (the bit depth) for each pixel. There is a considerable range of matrix sizes used for the various imaging modalities. As we see here, that produces a large range in the numerical sizes for images in medical imaging. Each of the medical imaging modalities (radiography, CT, MRI, ultrasound, etc) generally have digital image matrix sizes that are determined by characteristics of the specific imaging process and image quality requirements. There are many different methods and technologies used to store digital images. All computers and digital imaging systems have some form of electronic storage that is usually referred to as "memory". This form of storage or memory consist of an array of many electronic components (like transistors) that can be "set" to remember bits. This is a form of Random Access Memory (usually called RAM) because data can be written/recorded and read/retrieved to and from any place within the memory array ( random access). This is to distinguish it from a storage device, like tape, where the data is stored and retrieved in sequence. Relatively limited capacity in comparison to the other storage media. Requires electrical power to maintain the stored data. The RAM is used to store images and other data on the short term. That is while the images are being recorded, reconstructed, processed, displayed, etc. Image data and other forms of information (such as analog audio and TV) can be recorded on surfaces that can be magnetized. The recording and reading is done as the surface moves close to a device called a head. The magnetic surface is usually on a spinning disk or on a moving tape (VCR and audio cassette tapes are common examples). Here we look at the magnetic disk that is an integral part of most digital computers and imaging systems. It is often referred to as the hard disk to distinguish it from the more flexible or "floppy" disk that we common with computer systems in the past. The basic principle is illustrated here. As an electrical pulse representing each digital bit is applied to the write head, it produces a small magnetic pulse. This magnetic pulse then magnetizes a small spot on the disk with a specific magnetic polarity (On a larger scale we would think of these as the North and South poles). Let us recall that a bit is recorded by marking each bit position (fill-in-the blank spot) in one of only two possible ways. Earlier we illustrated this as either placing a mark in the position or leaving it blank. On the digital magnet disk each bit is recorded by magnetizing each bit position with one of two possible polarizations or directions. Here we see that represented by the black and white ends of the little "magnets", actually the magnetized areas on the disk. When the magnetized bits pass under the read head, they produce electrical pulses that pass on to the processor. The capacity (Megabytes) of a specific disk size is determined by how small the individual bit areas can be made. Disk technology is advancing rather rapidly and has moved the capacity of a single disk from the range of Megabytes to Gigabytes. 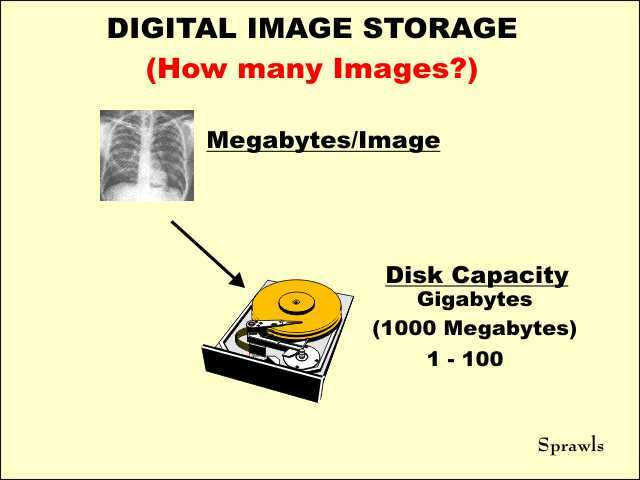 The number of images that can be stored on a magnetic disk depends on the numerical size of the images and the disk capacity. 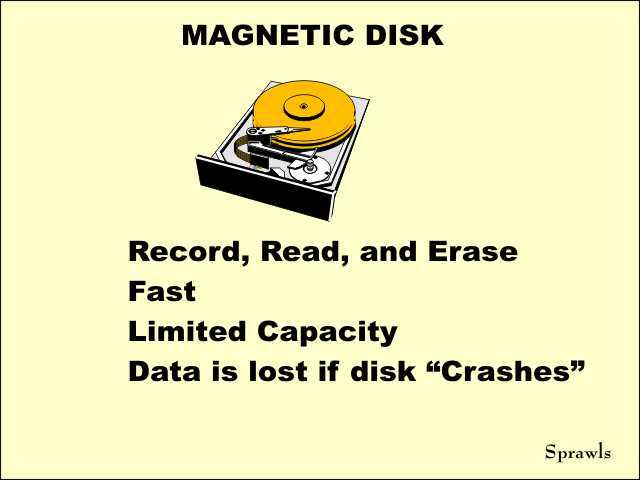 The advantages magnetic disk include the ability to write/record and read data very rapidly. Data that is no longer needed can be erased to make space available for new data. 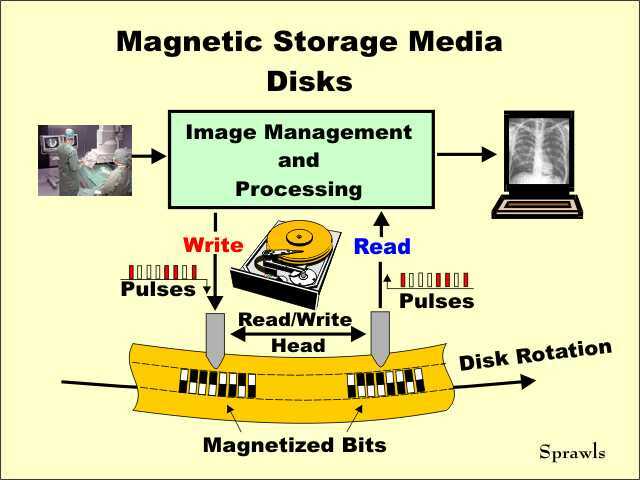 A limitation of magnetic disk is they might not have the capacity to store all images produced in a medical imaging facility. If image data is confined to a single disk, there is the possibility of the data being destroyed in the event of a mechanical failure, commonly known as a "crash". A RAID is a configuration made-up of multiple disk that are used together to make multiple copies of data (redundant copies) to reduce the possibility of loss in case of one disk failure. RAID configurations can also be used to increase the speed of some data processing and management operations. There are several types of digital storage media that record the data in optical form using light. 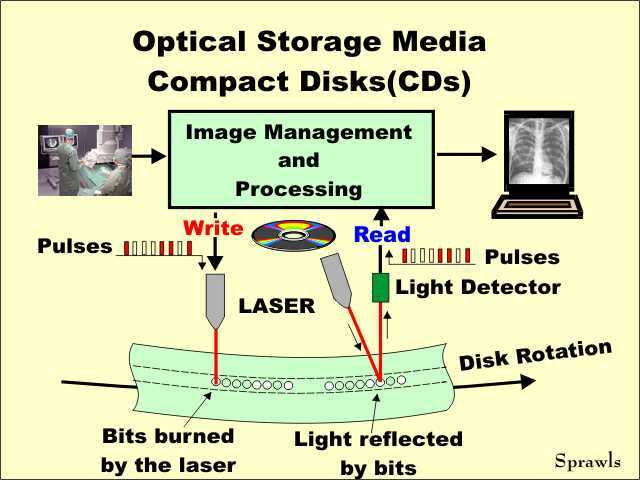 One of the most widely used, for both medical images and many other forms of data, is the Compact Disk (CD) that is illustrated here. The bit positions are located along a long spiral path running from the outer edge to near the center of the disk. The surface of the disk is material that reflects light. Writing or recording is done by a laser. This laser produces a relatively intense beam of light that is directed to the bit positions as the disk rotates. The laser beam is turned on and off by the series of pulses representing the bits to be recorded. If the beam is off as it passes over a bit position, the reflective surface is not affected, and that bit position remains as a "little mirror" that will reflect light. If the laser beam is on as it passes over a bit position, it "burns" the surface and destroys the ability to reflect. With this process each bit position is now marked by being either reflecting or nonreflecting. When the bit positions pass under the read laser (it is less intense than the write laser) they either reflect or do not reflect the light to a detector that converts the light pulses into electrical pulses. 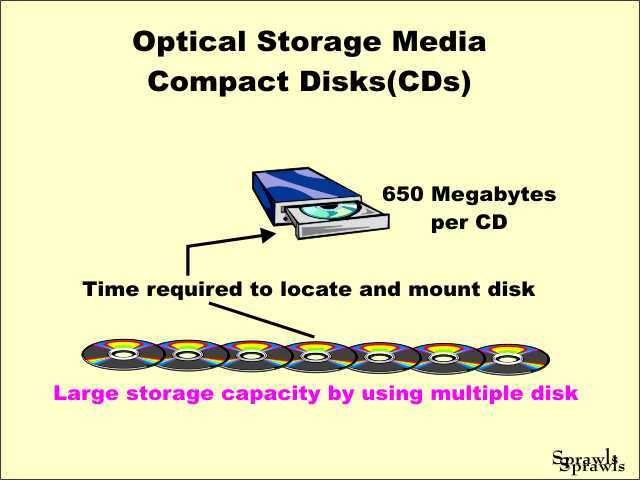 Optical media, such as CDs, have a relatively large storage capacity because the optical recording process can form very small bits on the surface of the disk. However, a major advantage is that most optical recording media, such as CDs, are on disk that are easily exchangeable. By using multiple disk many images can be stored or archived. One limitation is that the multiple disk must be filed in some system where specific sets of images can be located and retrieved when needed. This can be done manually or with some type of automatic retrieval system. The Optical Jukebox is a device for filing optical media disk. It is connected to the image management system. 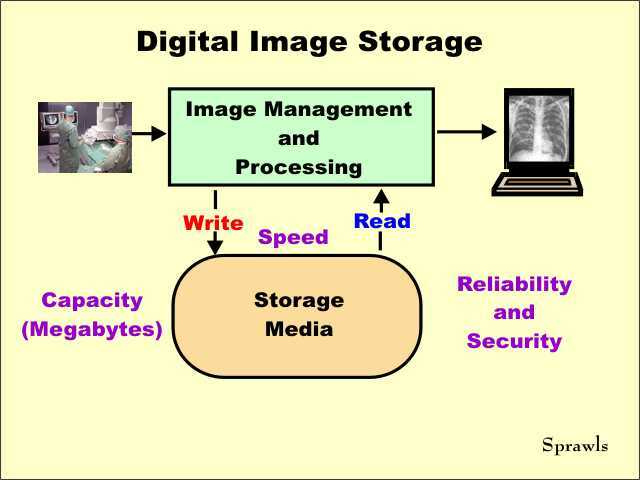 When the archived images for a specific patient are needed for viewing, the system locates the disk containing the images, mechanically inserts it into the reader, and the image data is made available for display. 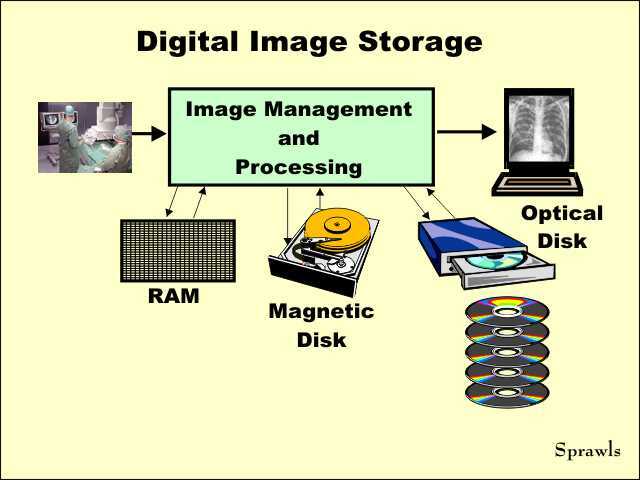 Most medical digital image systems use a combination of storage and memory devices. The function of each depends on it's capabilities and it's limitations. 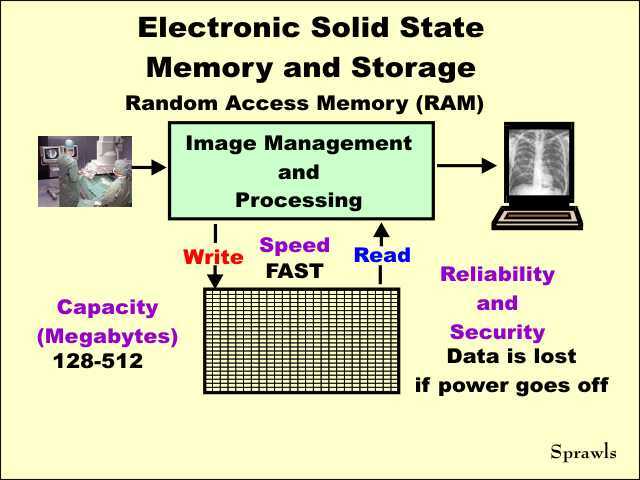 Random Access Memory (RAM) stores images and other data while the images are being recorded, processed, etc. It has a relatively limited capacity. Magnetic Disk store images and data that are generally available for immediate display and viewing. They might be in a RAID configuration for increased security and safety of stored images. Magnetic disks might not have the capacity for storing and archiving large quantities of images. Optical Media in several different forms can be used to store and archive large quantities of images.